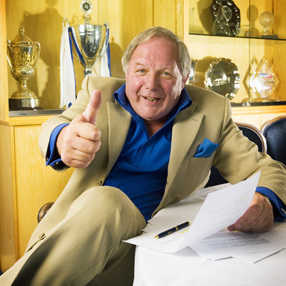 Peterborough Director of Football Barry “Bazza” Fry has placed himself on the transfer list. The cockney wideboy is famous for his transfer wheeling and dealing, but this is one of his boldest stunts yet. He has placed a £3 million price tag on his head and states that he can play at inside-forward, centre midfield or in a boardroom by buying a squad of 60 strikers at any one time. Fry has listed his wage demands as “competitive”. A source close to him has said that he could be tempted by £20,000 per year, a mock tudor semi detached house and a club owned Vauxhall Astra. In addition to faxing every professional and semi-professional club in England, Fry has also listed himself on eBay under the heading “LOOK! MAN UTD LIVERPOOL ARSENAL BARCA INTER DIRECTOR OF FOOTBALL, A++++ CONDITION”.